Brushing and Flossing with braces is very important. 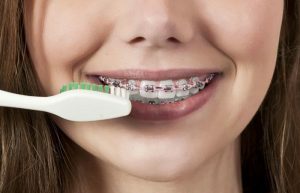 Here are a few tips on how to keep those new braces clean and your teeth healthy. Use a extra soft toothbrush. (An electric toothbrush such as a “Sonicare” is quite helpful.) A small circular motion (“wiggle-jiggle”) is preferable to a back and forth motion. Brush the braces and the surface of the teeth next to the braces. Clean the area between the braces and the gums by angling the toothbrush. You may lightly massage the gums at the same time. Brush the biting surfaces and the tongue side of the teeth. A Proxy Brush (small wire circular brush) may be helpful in cleaning under the wire and between the teeth. *Remember to clean the teeth and braces every time you eat, even if you have to brush without toothpaste. When you have the opportunity, you can finish the job properly. Pull the floss against the side of the tooth and pull up and down and then repeat along the side of the adjacent tooth. Remember to clean the tooth all the way under the gums. Remove the floss and continue throughout the mouth. *Remember to floss at least once a day.